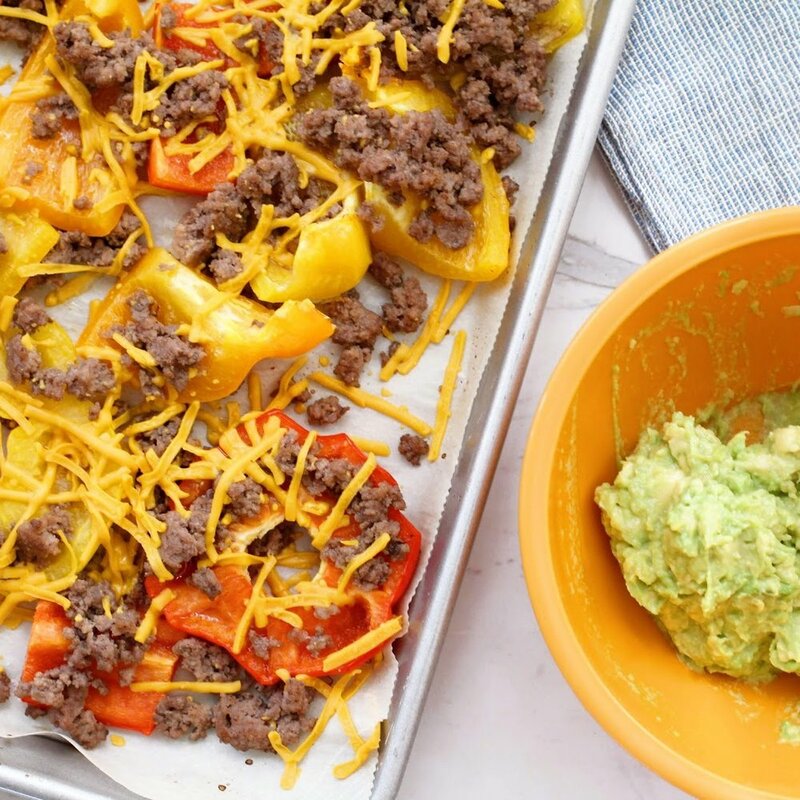 Yap you read that right... bell pepper nachos. Yall I am not going to lie they are the total bomb. I don't know why I didn't think of this earlier. Bell peppers are the perfect substitute for chips. This recipe is so so easy. Like total below par for Kara's level of easy. (Excuse me while I make a golf reference to try and impress my husband, some one tell me if I am not using it right). I feel like I say this all the time, but this recipe really does take no time to make. I hope you will give it a try, because it really is important to me that getting a healthy dinner on the table is easy to you. I know my kids need lots of iron at this point in their life, like lots. Beef is one of the best sources they are exposed to. I am also always saying how much children need fat, good, clean healthy fats. Grass fed beef is a great place for them to get this. Other forms of beef have higher levels in the not so healthy fats category. Lastly, I have prioritized this as one of the ways to lower our toxic load (toxins we let in our bodies). This is done from the perspective of cost and ease to make it happen. That is a super high level view on why I buy grass fed beef, but please reach out if you want to discuss my reasoning more. Cook both pounds of ground beef in a skillet. Season with garlic, salt, and pepper. Cut up your vegetables: mango, onion, and avocados. Pull off about a 1/2 cup of cilantro leaves. But the bell pepper, cut the ends of, then cut into large squares. Wash the lettuce and leave in large pieces for "taco shells." Make the mango salsa with mango, purple onion, and lime. Put away the cut bell peppers, half the cilantro, and half of the ground beef. Plate your taco bowl. Lettuce in the bottom with ground beef on top, salsa, cilantro and avocado. Enjoy! Preheat oven to 400 degrees. Line a sheet pan with parchment paper. Lay out the bell peppers. Drizzle with the avocado oil. Pull out the bell peppers and top with ground beef and cheese. Put back into oven until the cheese is melted. Remove and top with the rest of the cilantro and avocado. Feel free to adapt the taco recipe to how best works for your family. If you want to make some rice to have in the taco then go ahead. I will say the lettuce wraps were more than enough for us. My children love both nights of this recipe. They aren't huge bell pepper fans either, but they went for it. Two pounds of ground beef is a lot of meat. So, be sure whatever pan you cook it in is large.